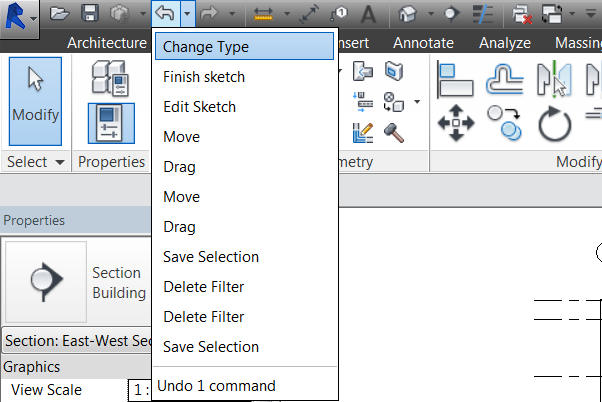 If you’re like me and the Undo command gets a lot of use with your day to day use of Revit or any Software for that matter. I find using the drop down to the right of the Undo command useful. It will let you go back to a specific point in the commands where you have been working in. This is especially useful as some of the “Undo’s” you do are not always obvious and you can’t be sure how far back you have “Undone”. When you consider, you generally only know you need to Undo once you’ve finished the command and then it’s a rush to get back to the start to start again using the drop down is a far better way to Undo. Just select the name in the list to go back to that point. The Flip of the Undo command is the Redo command and its drop down list. This is obviously reverse of Undo and will take to back to a point if you “Undo” to far.